SKIP 'Casino Party in a Box'. Introducing CASINO IN A PARTY - CASINO PARTY IN A BOX. 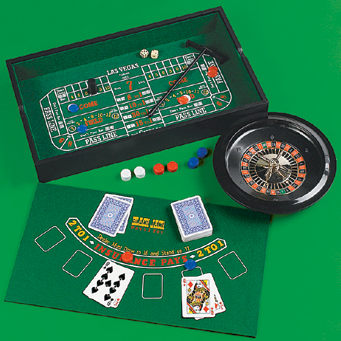 This is a Casino Night in a box, everything you need for your school casino party is included - Including Decorations! Enough equipment for 70% of your anticipated guest total included in package game lineups. These packages include our "basic popular staple games": BLACKJACK / POKER / ROULETTE / CRAPS. 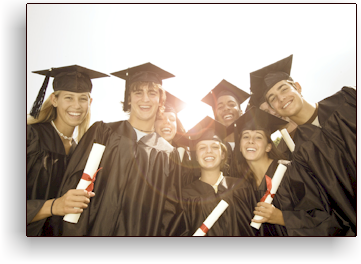 This category offers the lowest cost options. This category offers the lowest cost options and includes Felt Cloth Layouts for gaming surface(s). Blackjack Felt Blue HOT ITEM: Now Available in Blue! These 36X72" felt cloths typically are available in green but we now have a limited offering of blue - this adds a little pizzazz to you blackjack lineup. Also available in green. Blackjack serves 7 Players Each. Requires 4-6' banquet table. 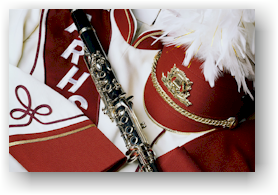 As with all other games in the bargain package, standard banquet tables are used for the cloths that we provide for your package. Your craps game will require some sort of vertical backboard or "walls" to keep the dice on the table. It is not recommended to host a craps game without walls as the dice will leave the table nearly every throw. For the purpose of this package, a simple set of COLLAPSIBLE WALLS is included. You will need to utilize a ust like the Roulette You will need to acquire an ordinary six-foot standard banquet table which are almost always 36" wide. The cloth is exactly 36X72" and lays out quite nice with minimal stretching. The included walls set directly on top of the cloth-covered table. Wall dimensions are slightly smaller than the table to allow for a ledge around the outside of the walls for the players. Walls constructed of 3/4" plywood and is approx. 66"X30"X12" high. Top of wall is finished 2" wide premium pine stock. Finish is black satin. With closed-cell black foam padding at each end. Includes metal hardware to lock walls together. Assembly time 5 minutes. 9-tube CHIP TRAY, DEALING SHOE, DISCARD HOLDER. 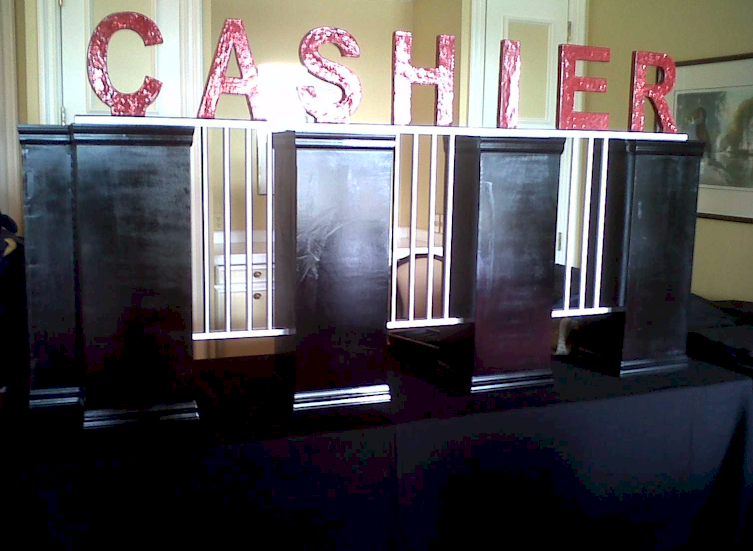 (6) DECKS OF CARDS, CUT CARD, ACRYLIC SIGN HOLDER. Item #: Tray TM10-0806, Shoe TM10-2010, Discard TM10-2030, Cards OH, Cut OH, Sign OH. Casino Chips For the purpose of this package we recommend 320 chips. Please Note: 250 CHIPS BARE MINIMUM REQUIRED. 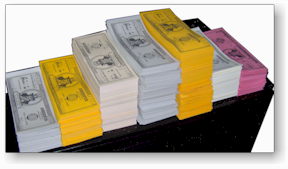 Cheques WITH DENOMINATIONS will avoid alot of hassle down the line. Although we offer many different styles and cost of chips, the following limited special purchase is our current best value as of 02/24/11. The chief advantage of these chips is that there is no label that will peel off, the coin is inlayed. (20) Yellow $1000 Chips, (20) Blue $5000 Chips. 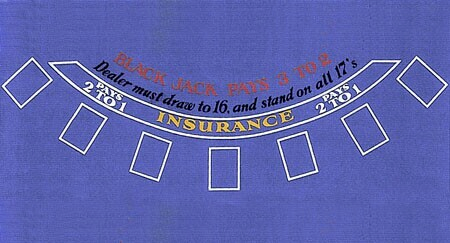 TOTAL COST PER BLACKJACK: $125.00 (DOES NOT INCLUDE SHIPPING AND CRATING). Poker Felt HOT ITEM: Now Available. 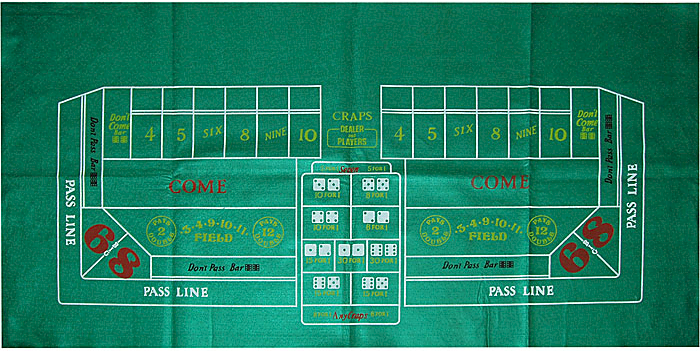 Skip the basic linens and use this 36X72" cloth for poker, adds a "casino flair". Serves 6 players each comfortably (but can serve as many as 8 or more). Requires 4-6' banquet table. 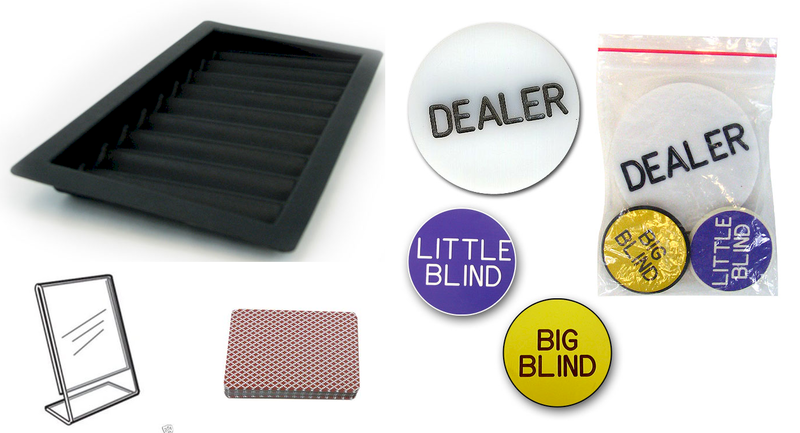 Poker Accessories Package Poker Accessories Package includes: 9-tube CHIP TRAY, (1) DECK OF CARDS, DEALER/BLIND BUTTONS, ACRYLIC SIGN HOLDER. 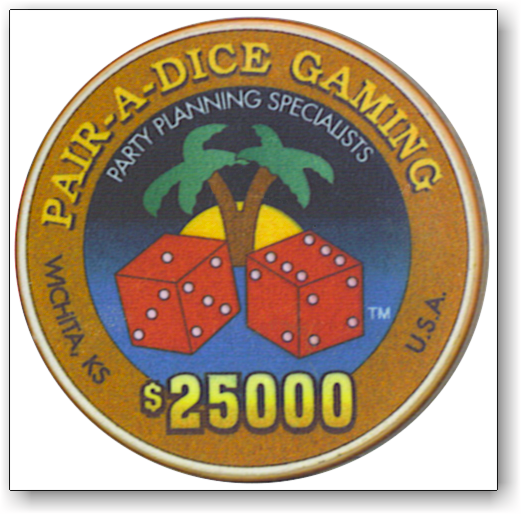 Poker Chips In an effort to bring you a lower cost, we offer the advantage of ordering plain color chips with your poker games. Plan on a Texas Hold 'Em Tournament-style lineup of poker games (typically hold 'em tourneys are indeed played with solid color chips in most casinos). BEST VALUE: These are the same chips we use for roulette and are an exceptional cheque for the price. You will need: (60) Red Chips, (120) Green Chips, (120) Black, (80) Purple, (40) Orange, (40) Yellow, (40) Blue. 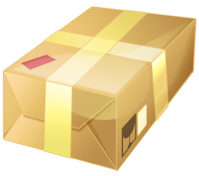 TOTAL COST PER POKER: $85.00 (DOES NOT INCLUDE SHIPPING AND CRATING). 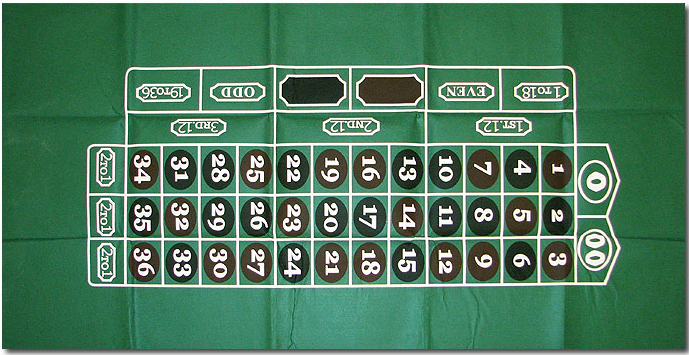 Roulette Felt Classic 36X72" felt cloths available in green. Roulette serves 8 Players Each. Requires 6' banquet table. 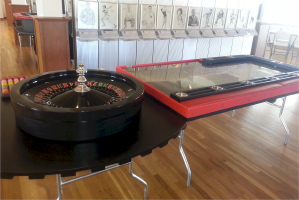 Roulette Accessories Package includes: 9-tube CHIP TRAY, (2) STACKABLE RACKS, (1) CLEAR MARKER, 16" WHEEL w/ Bushing, ACRYLIC SIGN HOLDER, 1000 CHIP INVENTORY TRAY, . For the purpose of this package we recommend 1000 chips. 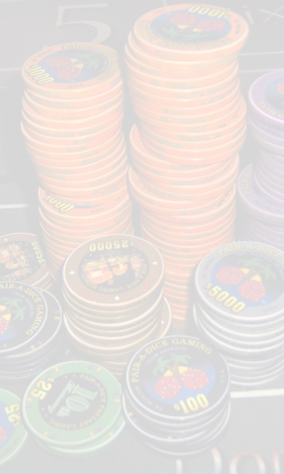 We offer the advantage of plain color chips with your roulette games. 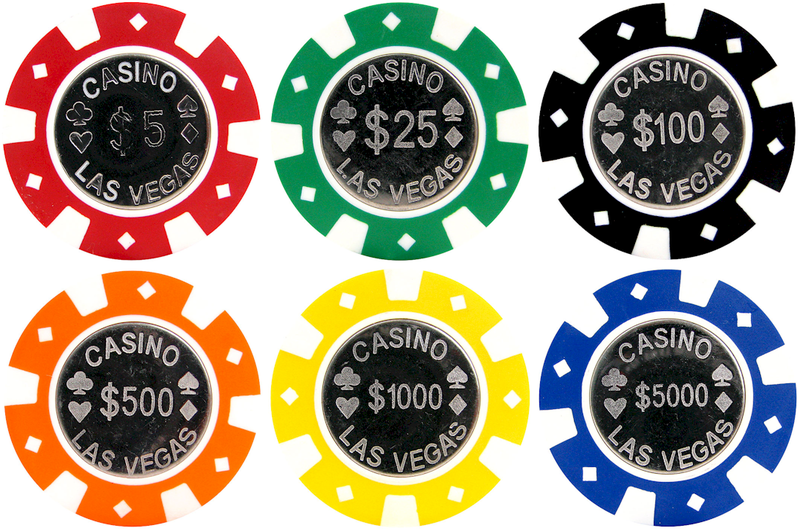 Each player receives a different color, this GREATLY reduces confusion (casinos use solid color chips for their roulette games). BEST VALUE: These are the same chips we use for poker and are an exceptional cheque for the price. 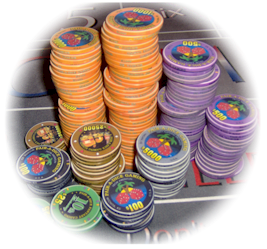 (100) White Chips, (100) Red Chips, (100) Black, (100) Brown, (100) Blue, (100) Lt. Blue, (100) Green, (100) Purple, (100) Pink. Experience has taught us that a few high denomination general casino chips (in addition to the colored chips) is a MUST_HAVE at the roulette table. This allows the dealer to pay large wagers (or else the dealer would QUICKLY run out of the colored roulette chips). Players can win up to 35-1 at roulette. (60) Black $100 Chips, (60) Orange $500 Chips, (40) Yellow $1000 Chips & (40) Blue $5000 Chips. TOTAL COST PER ROULETTE: $225.00 (DOES NOT INCLUDE SHIPPING AND CRATING). 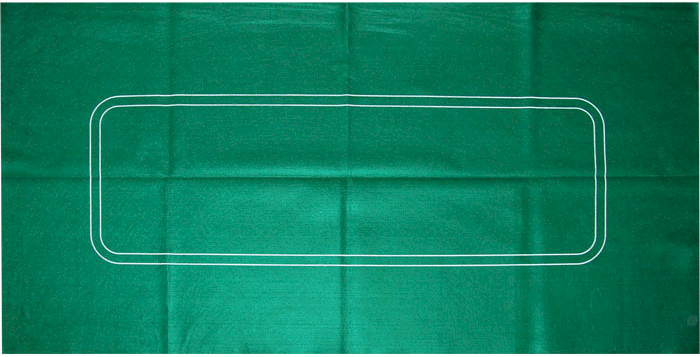 Classic 36X72" felt cloths available in green. Craps serves 8 Players Each. Requires 6' banquet table. Also requires "Craps Walls". Craps Accessories Package includes: (8) ACRYLIC STACKABLE CHIP RACKS (10 racks shown in photo), DICE BOWL, (2) ON/OFF PUCKS, (5) 1/2" DICE, ACRYLIC SIGN HOLDER. Chip Tray Note: Due to the limited space on the layout, it is not feasible to have a regular chip tray. 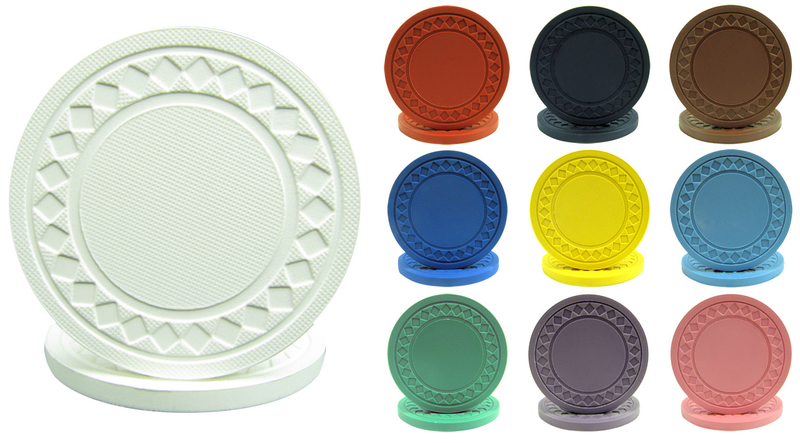 A series of clear stackable chip racks is the perfect solution to keep your table tidy. 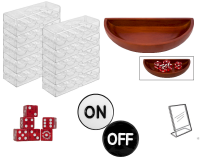 Item #: Tray TM, Bowl TM10-5025, Pucks TM10-5020, Dice TM10-DICE-5, Sign OH. Your craps game will require some sort of vertical backboard or "walls" to keep the dice on the table. It is not recommended to host a craps game without walls as the dice will leave the table nearly every throw. You will need to utilize a ust like the RouletteYou will need to acquire an ordinary six-foot standard banquet table which are almost always 36" wide. The cloth is exactly 36X72" and lays out quite nice with minimal stretching. The included walls set directly on top of the cloth-covered table. Wall dimensions are slightly smaller than the table to allow for a ledge around the outside of the walls for the players. 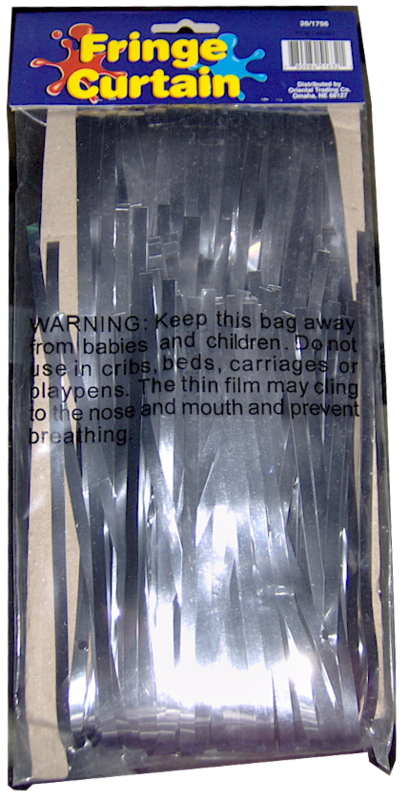 For the purpose of this package we recommend 800 chips. 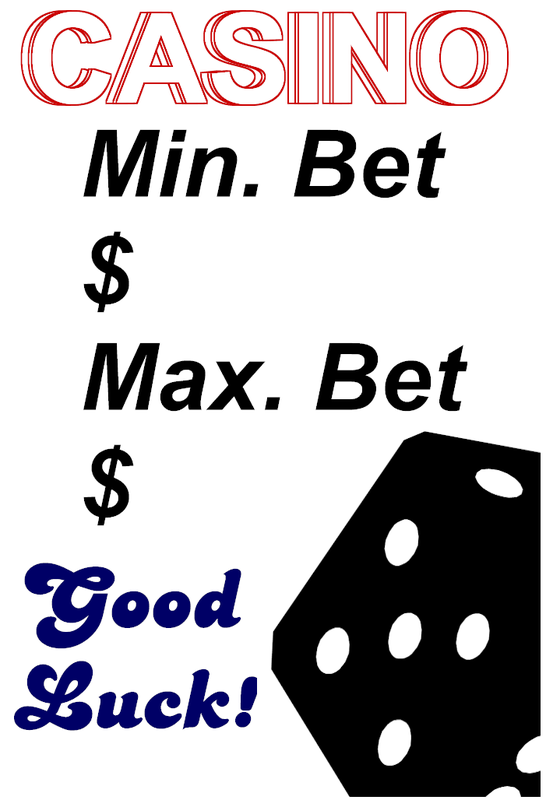 There are many different bets with large payoffs at the craps table so you appreciate the extra chips! Although we offer many different styles and cost of chips, the following limited special purchase is our current best value as of 02/24/11. The chief advantage of these chips is that there is no label that will peel off, the coin is inlayed. You will need: (100) $5 Chips, (200) $25 Chips, (200) $100 Chips, (100) $500 Chips, (100) $1000 Chips, (100) $5000 Chips. TOTAL COST PER CRAPS: $300.00 (DOES NOT INCLUDE SHIPPING AND CRATING). 1000-Chip Inventory Tray for each 1000 chips. Laminated Table Sign (that fits into clear acrylic holder). Just fill in your amounts with a "sharpie" and clean later with rubbing alcohol. Fun Money. Black & white on colored paper (that matches the chip colors). Comes with Money Storage Baskets (one per game). Bank Includes Thousands, Five-thousands and Twenty Five-thousands. Qty 20 ea denomination per guest. (example 100 guests 6000 bills). With Wooden Fun Money Storage Rack. (12) Metallic Wall Curtains in your choice of colors. These curtains are super lightweight and hand with scotch tape and look great! They really dress-up an area. For additional flair consider adding a lighting source. Curtains are 3' wide X 8' height. Twelve included for a total of 36'. We recommend hanging the curtains near the cashier or near the entrance. Double Sided Tape to attach cloths to tables. Two rolls included. Dealer 'Winner's Logs' (our default giveaway prize method). All items arrive is custom-made carpet-lined black satin-finished locking road case with wheels and pull strap. This is such an important element that we are offering this option to the Bargain Basement packages (we we changed the design to allow for a lower cost). 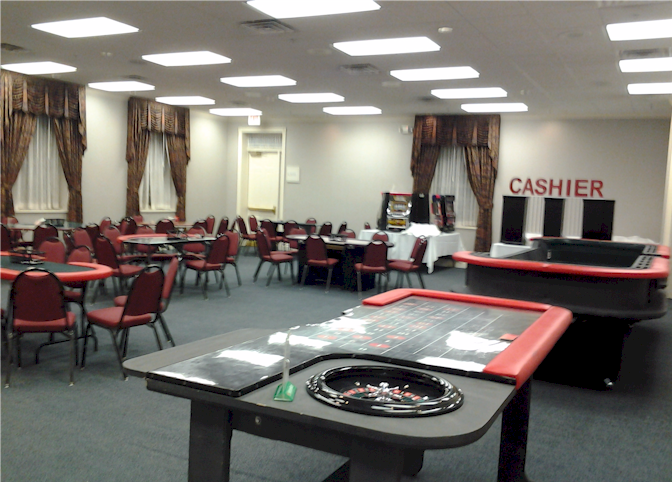 Provides a central "command center" for your casino night (in contrast to a series of banquet tables). The activities of the cashier staff is partially obscured from the guests. Offers your tellers the ability to stay organized with plenty of useable space for casino night supplies which is also hidden from guests. 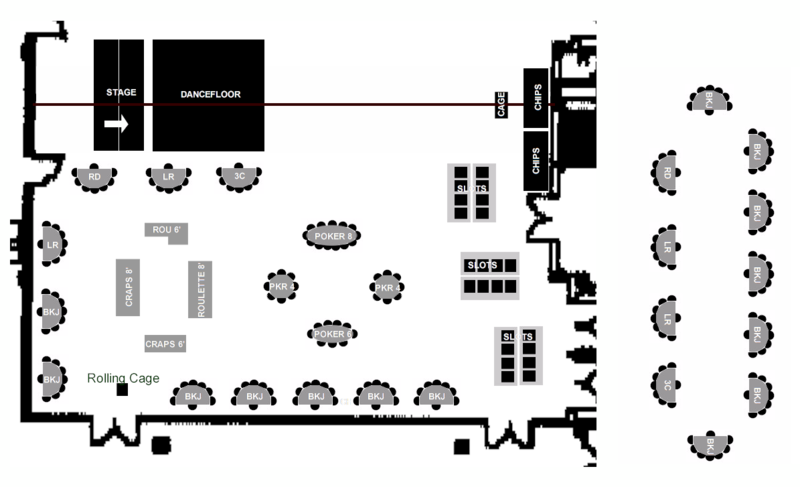 Provides a definite "information center" for the guests. Guests know where to go to get started. Offers the ideal spot to post signage - All guests will stop here. Definitely increases the "casino-like atmosphere"! 6' / 2-window Version $400. 6' Banquet Table required. 8' 3-window Version $600. 8' Banquet Table required. Boxes 24" height (similar to the ones pictured above - they are 36"). Black Satin Finish. (2) Blackjack<14>, (1) Poker<6>, (1) Roulette<8>, (1) Craps<8>. 3200 Chips (3140 w/ 60 extra). Fills (2) #1000 Chip Trays, (12) Stackable Racks. Total Yield 36 Player Positions. (6) Blackjack<42>, (2) Poker<12>, (1) Roulette<8>, (1) Craps<8>. 5000 Chips (4920 w/ 80 extra). Fills (4) #1000 Chip Trays, (10) Stackable Racks. Total Yield 70 Player Positions. (8) Blackjack<56>, (3) Poker<18>, (2) Roulette<16>, (2) Craps<16>. 8200 Chips (8060 w/ 140 extra). 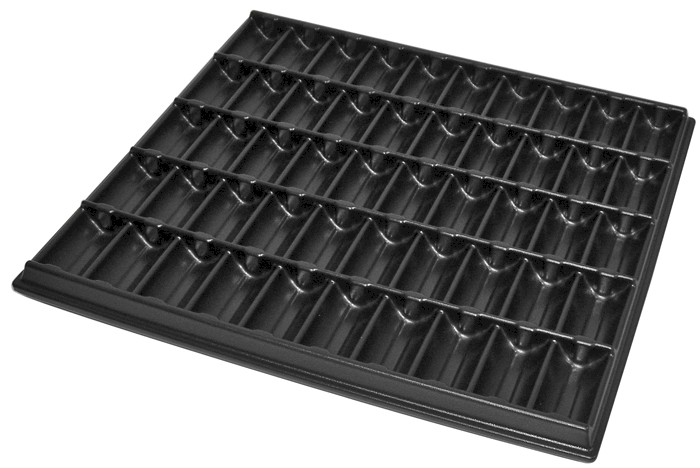 Fills (7) #1000 Chip Trays, (12) Stackable Racks. Total Yield 106 Player Positions. Contact Amerifun first at (316) 821-0202 for all your casino games rentals at rates up to 50% off. 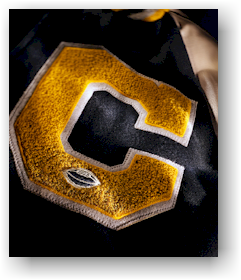 We also offer low-cost economy games (cloths) for rent for $10 ($5 for schools) or purchase at a cost of $20 ea.. We also offer Chip Rentals to schools for the same same 50% off discount. If you are having an all-nighter make sure you keep your dealers in plenty of breaks to keep them fresh! Another great idea to finish off your all-nighter is to cook breakfast for the students a couple of hours before end time or before dawn. If your event is at the school you probably have a kitchen- turn those dealers into chefs! If your venue does not have a kitchen, full-service catering always available to fit your schedule. Please visit the menu for a look at breakfasts.